Last night, MLB Commissioner Rob Manfred talked openly about what city the MLB’s newest expansion team might be hosted in, naming Montreal, Charlotte, and Mexico City as likely candidates. “Let me go back to a conversation we’ve had already. 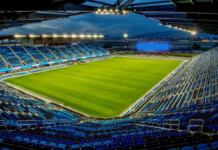 I think for us to expand we need to be resolved in Tampa and Oakland in terms of their stadium situations. As much as I hope that both Oakland and Tampa will get stadiums, I think it would be difficult to convince the owners to go forward with an expansion until those situations are resolved. Last year, Charlotte was also named as a possible MLB expansion city, but in a longer list. In an interview with the Associated Press last year, Manfred listed; Charlotte, Oklahoma City, Mexico City, Portland, Las Vegas, Montreal and San Antonio as possible MLB expansion cities. The MLB has expanded since 1998 when the Tampa Bay Rays (originally the Devil Rays) and Arizona Diamondbacks first started. Given the growth of major league baseball’s popularity, and after almost 20 years of no activity, the jump from 30 teams to, say, 32 now seems overdue. 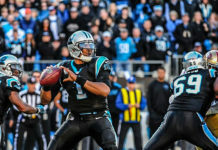 If (and when) Charlotte is chosen to host it’s own major league baseball team, one of the biggest questions on everyone’s mind is where will the stadium be. 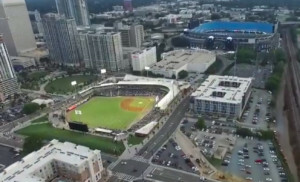 The BB&T field in Uptown Charlotte was not designed to be retrofitted for major league standards, and city planners don’t think Uptown could handle the additional traffic and parking during the 81+ major league home games (many of which are on weekdays). What do you think about a new MLB team in Charlotte? Where do you think the new major league field should be built? Focused on telling the world how awesome Charlotte is. Do you have an upcoming event in the Charlotte region that you think should be on our calendar? Click here to let us know about it!